I am a Bollywood buff. The theatre is where you can find me almost every weekend!! Last weekend was no different!! Among the three Bollywood releases; Total Siyappa, Gulaab Gang and Queen, I picked Queen and I have to say, I made a great decision!! I was shocked to find myself sitting in the theatre, ‘enjoying’ a Kangana Ranaut movie. 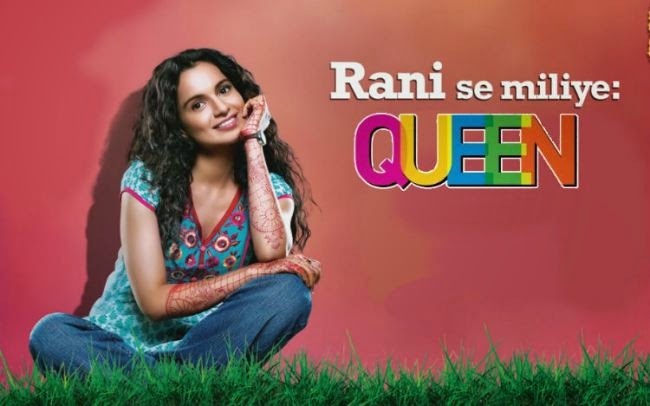 Firstly, Queen was probably the first Kangana Ranaut movie I watched in the theatre. That’s because I always had this stereotypical image of her: Who in their right senses would waste their money watching her movie in a theatre, right? Secondly, it didn’t have any big names involved, a small budget movie, something that could even be enjoyed at home. But with an IMDB rating of 9.0 and hundreds of great reviews, I knew that this is one movie I have to watch!! Not only that, the trailer was impressive enough. The concept in itself was refreshing and fresh. A girl who goes on her honeymoon alone because her fiance left her in the lurch. Along her journey, she discovers herself and the emotions and talents hidden within her. This may sound like ‘any other story’ but the way it is executed sets it apart from the rest. Kangana deserves a thumbs up for her performance in Queen!! From a docile, weak and dependent girl to an independent, carefree (yet rooted) and strong woman, Kangana beautifully expressed herself as Rani. She justified her role and played it with absolute conviction, as a simple yet sweet girl. It is well said that ‘No revenge is the best revenge’ and that is exactly what Rani (Kangana’s character) did. She enjoyed herself and had the time of her life, that was how she achieved her revenge. Despite having a concept so serious, there were inumerable moments when I laughed uncontrollably!! I was so engrossed that I felt the interval came a bit too soon (which is very rare in the case of other painfully boring movies).Vikas Bahl with just his second film has proved to be a promising filmmaker. Rajkumar Rao had a small but impactful role. He got me to hate him, his character, I mean and I think that’s exactly how he suceeded as an actor. With a few long lasting friendships here and there, Vikas Bahl conveyed to us that friendship indeed needs no language. All this topped with some simple and sweet music by Amit Trivedi, not to forget the implementation of the classic, ‘Hungama ho Gaya’, Queen is a must watch and you just cannot let this pass! !